Check out the seriously groovy Jazzmaster vibe of this ElectraJet! The burst finish, tortoise guard and pickup color, plus the rosewood, really brings out the JM here. 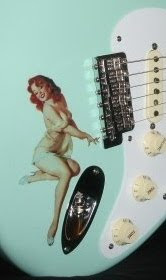 Nice Strat-Jazz hybrid config by Don Grosh! Atlanta's Boutique Guitar Exchange is currently listing this guitar as new with OHSC. The alder body is finished in nitro with Grosh's own P90's they call "G90's". And the Indian rosewood board has 6150 frets which are a little shorter than 6105's, but fatter. The seller is a Grosh dealer, plus they're also listing new guitars from Suhr and Tyler, including a couple of Tyler's "Burning Water" finish S-types.